เชิญมาร่วมสนุกกับเรา Come along and join us at the W District (Egg Theater Room) to watch Improv Comedy during the Bangkok International Improv Festival. If you like ตลก 6 ฉาก, บริษัทฮาไม่จำกัด, "Whose Line Is It Anyways", "Second City", Steve Carell, Kristen Wiig, Amy Poehler. Then bring your family and friends. Sharing is caring!!! is a Hong Kong-based stand-up comedian and improviser who has been cutting up audiences around Asia for over eight years. He has also hosted or opened for a long list of visiting international comics, including Tom Cotter, Paul Ogata, Tom Segura, Ruben Paul, Barry Hilton and Ari Shaffir. 852 Crew is made up of expat and local HK improvisers who have performed all over Asia. Fresh off successful shows in 2017 at the Manila Improv Festival, Mahua Improv Festival in Beijing, in Hong Kong, and at the Singapore Improv Festival, 852 Crew is looking forward to bringing their long form improv to more people! Hilarious, warm-hearted, and dazzling! Our show offers a volatile combination of experienced storytellers with a rough-around-the-edges vibe that should not work, but somehow does. Come experience the comedy salvo of the United Nations of Improv, AKA Skits & Giggles! is an award-winning international improv theatre artist from Chicago with over 30 years’ experience. He’s a creator, director, improviser, producer, and teacher, and he’s also the Founder and Executive Director of Chicago Improv Productions. He co-founded the Chicago Improv Festival and produced it for 20 years. He created and produced the College Improv Tournament for 10 years. He was Teen Comedy Fest’s executive producer for 7 years. He’s also the founder and producer of Chicago Podcast Festival for the past 2 years. He has taught and performed internationally in 12 countries, as well as all over America. He’s performed in over 1,250 improvised shows. He has created the improv shows, “The Make ‘Em Ups”, "The Oracle", "The Silent Movie", “Solo Plus One”, “Stopwatch”, and "Storybox Unscripted Theatre". He taught at The Second City for 16 years and he’s a contributing writer to their book on improvisation. He taught story-based improv at Piven Theatre Workshop. He’s also taught at 25+ American cities at regional improv fests and improv theatres. For 3 consecutive years he was selected by New City magazine as one of "Chicago's Top 50 Theatre Players" and he’s been interviewed about improvisation in books, newspapers, online posts, podcasts, radio, and TV. 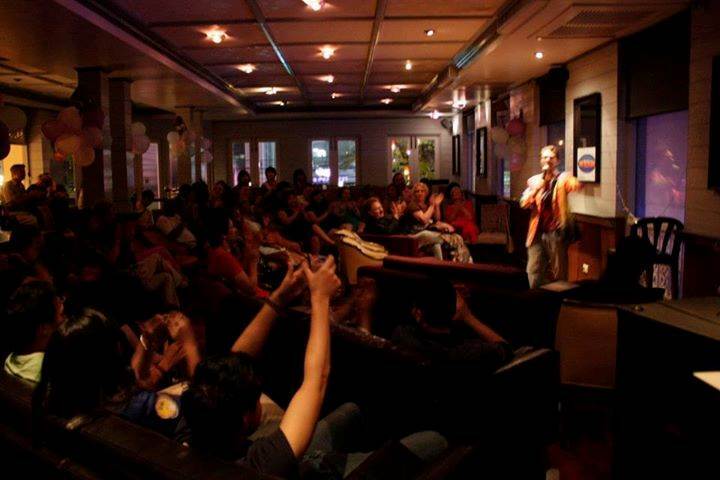 Come join us on a Saturday night and bring YOUR suggestions/ dating stories to see international performers create hilarious improv comedy scenes only at the Bangkok International Improv Festival. Because laughter is the best medicine.